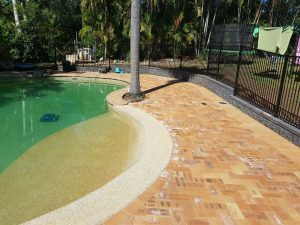 Brisbane swimming pool paving, tiling and fences. We will make your old pool great again! Is your swimming pool more than 20 years old and in need of a face lift? 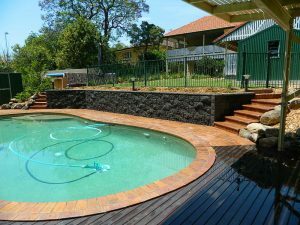 Brisbane Home Landscaping can repair or upgrade all your swimming pool surrounds and give it the vibrancy and welcoming style once again. Are you finally building your dream pool getaway? A pool isn’t just a hole in the ground, it’s a children’s playground, a parents escape and a family’s salvation, especially in our Queensland summers. So let Brisbane Home Landscaping make your pool surrounds come to life so you can relax and get out of the heat. Brisbane Home Landscaping can help you choose and install all your pool fencing requirements. 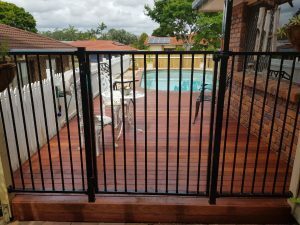 Whether you want, timber, aluminium, glass, timber slats or screen fencing, be rest assured your fence will be installed not only using the quality products but with stringent precision to meet all state pool fencing laws. Not only is the correct pool fencing going to enhance your yard but it can also save lives, get it right the first time by a professional. Paving an area around your pool can provide not only a visually pleasing style to your pool area but also a safe non slip surface which is maintenance free to be enjoyed and used for many years. Brisbane Home Landscaping can provide a new deck to your pool areas or renovate and rejuvenate an old and tired deck. Make your pool area the oasis it should be and create a functional and visually appealing deck which can expertly integrate with your family pool and backyard design. Having a pool is more than the pool itself, its about the surrounds of your pool area and yard as well. Choosing the correct plants for around your pool is important and many plants will overgrow and encroach on your pool or living space in time. When selecting the correct plants for your pool area you must consider many different elements. Brisbane home landscaping can help you choose the perfect elements for your pool surrounds, tropical plants and lush greenery for your pool side gardens, new lawn exteriors or visually aesthetic rock formations so they complement your pool and home.